From left, County CEO Gary McBride, Board of Supervisors Vice Chair Josie Gonzales, Board of Supervisors Chairman Curt Hagman and Gov. Gavin Newsom listen to presentations outlining the county’s efforts to combat homelessness. 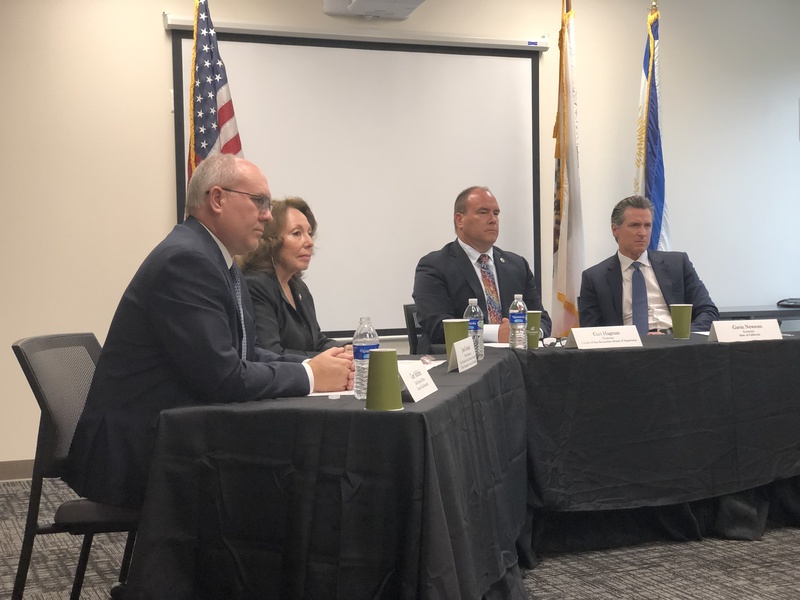 San Bernardino County officials and their community partners impressed California’s new governor this week with the various strategies being employed to combat homelessness in America’s largest county. Gov. Gavin Newsom said he was so inspired by the “big ideas” at work in San Bernardino County that he will work with the state Legislature to set aside funding in the state’s upcoming 2019-2020 budget to enhance support for the county’s efforts. San Bernardino County’s innovative approaches to address homelessness – which have received accolades at the state and national levels – focus on collaboration, creation of available dwelling units, whole-person healthcare, jobs, and technology. Efforts are coordinated by the county’s Interagency Council on Homelessness, which is chaired by Fifth District Supervisor Josie Gonzales and includes representatives from many cities within the county, and a variety of county departments, non-profit organizations, and other service providers. Managed healthcare to ensure newly-housed people achieve and maintain physical and behavioral wellness to help prevent them from reverting to homelessness and relying on more costly emergency room care for their basic needs. The conversion of hotels and motels to provide homes for the homeless. The Housing Authority of San Bernardino County and its private sector partners are in the process of converting motels in San Bernardino and Victorville into housing for homeless people. Tod Lipka, president and CEO of Step Up said there are 75 hotels and motels in the region that could be converted into housing if the state could provide funding for rent vouchers. The San Bernardino County Department of Public Works today reopened Greenspot Road, which is a major connector for the community of East Highland, Mentone, Redlands, and Yucaipa, as well as Highway 38 for mountain commuters. During heavy rainstorms on Feb. 14, a portion of Greenspot Road near Florida Street was washed out by heavy storm water flows in Mill Creek and has been closed to traffic since then. One of the biggest challenges was restoring Mill Creek back to its original flow path in order to prevent future erosion of the roadway. Over 50,000 yards of material needed to be moved in order to protect the roadway. This work was complicated by the series of storms that occurred after Feb. 14. The 2018/2019 storm season has been the wettest since the 2010-2011 storm season, with rain gauges in the county receiving anywhere from 125 percent to 185 percent above the normal seasonal average. The Department of Public Works Flood Control District and Transportation Department team, along with a contractor, Jeremey Harris Construction, have been working together to restore the creek and repair the road in order to reopen it to the public. The Department of Public Works appreciates the collaborative effort displayed by the City of Redlands and utility agencies that were involved. County crews will still be working on the roadway in the next couple of weeks to place permanent guard rail and traffic striping. Motorists must be ready to slow down and pay attention to construction traffic signs to ensure everyone’s safety. The cost of the repair work is anticipated to be more than $400,000 once the project is finished. The County Department of Behavioral Health has been approved to implement its Innovative Remote Onsite Assistance Delivery (InnROADs) program with a budget of $17 million over five years. On Feb. 28, the department successfully presented the InnROADs project to the Mental Health Services Oversight and Accountability Commission . The InnROADs project is funded through the Innovation Component of the Mental Health Services Act, also known as Prop. 63. “We are pleased to bring such an innovative project to San Bernardino County that addresses persons who are homeless, have a serious mental illness/addiction and are living in our rural and remote areas,” said County Behavioral Health Director Veronica Kelley. The five-year, time-limited learning project, is a multi-agency, multidisciplinary approach to engaging individuals experiencing homelessness and mental illness in rural areas of San Bernardino County. The project is a collaborative effort among four county departments – Behavioral Health, Aging and Adult Services, Public Health and the Sheriff’s Department. The goal of the InnROADs project is to build trust, help support and care for communities and eventually link them into the appropriate system of care. “These funds will enable a multidisciplinary team made up of our essential partners, to go into our rural and frontier areas via five off-road mobile teams, to treat in place and assist moving our homeless population into permanent supportive housing with a focus on treating their mental illness and/or addiction,” Kelley said. Possible treatment could include counseling, medication and basic physical health screenings. Through this project services will “go to” the individuals in need, no matter where they are located within San Bernardino County. County Behavioral Health, through the Mental Health Services Act, is supporting the Countywide Vision by providing behavioral health services and ensuring residents have the resources they need to promote wellness, recovery and resilience in the community. Information on the Countywide Vision and on County Behavioral Health can be found here. The Board of Supervisors is seeking individuals to serve on the County Building and Safety Appeals Board. “The mission of this board is important, and I urge anyone who feels they are qualified and who is interested in serving their community to apply,” said Board of Supervisors Chairman Curt Hagman. The Building and Safety Appeals Board is a technical review panel. It is charged with considering matters in which property owners and builders believe the County has incorrectly applied the Building Code during plan review, construction, or to an existing building resulting in that building being declared substandard or unsafe. Applicants for this board should be familiar with construction and the California Building Code. The board has five seats plus three alternate positions. All members – regular and alternate – must have the knowledge, experience and training necessary to review and reach decisions on matters pertaining to building construction and applicable Building Codes, regulations and ordinances. Two members of this board will also serve as members of the County Physically Disabled Access Appeals Board. This five-member board, with three alternates, will consider appeals to County decisions as they pertain to disabled access, consider ratifications of certain exemptions to accessibility requirements, and serve as an adviser to the County Building Official on disabled access matters. The Building and Safety Appeals Board will work toward achieving the Countywide Vision by capitalizing on the county’s diversity, ensuring a sustainable system of quality community elements, and governing in an open and ethical manner. Members of the board will be appointed by the Board of Supervisors and serve four-year terms. Anyone who believes they are qualified and who is interested in serving on the Building and Safety Appeals Board may apply at http://cms.sbcounty.gov/cob/Forms/BCCApplication.aspx or in-person at the Office of the Clerk of the Board of Supervisors, 385 N. Arrowhead Ave., Second Floor, in San Bernardino. California State Veterinarian Dr. Annette Jones today modified Southern California’s quarantine area to further restrict bird movement as work continues to eradicate virulent Newcastle disease (VND). The quarantine mandates the reporting of sick birds and prohibits poultry owners from moving birds in all of Los Angeles County, and in large areas of San Bernardino and Riverside counties. The modified quarantine extends from the northern and southern borders of western Riverside County to the Salton Sea—including the Coachella Valley—and as far east as Yucca Valley in San Bernardino County, with a northern boundary of State Route 58 at the Kern County line. The quarantine language and a map may be found at CDFA’s VND Web site. The quarantine requires bird owners to allow diagnostic testing, to isolate poultry from other species, to cease exhibitions, to stop the shipping and receiving of birds, and to enhance biosecurity. VND is a nearly-always fatal respiratory infection in poultry. Birds may seem healthy but will die within days of being infected. There is no cure. The virus is also transmitted by people who have VND on their clothes or shoes, and by equipment or vehicles that can transport the disease from place to place. There are no human health concerns provided that any meat or eggs are cooked properly. People who come in direct contact with the virus may develop conjunctivitis-like symptoms or run a mild fever. The only way to stop the virus and eradicate the disease is to euthanize birds. This includes all infected birds as well as birds within heavily-infected areas. Since May 2018, staff from the California Department of Agriculture (CDFA) and the U.S. Department of Agriculture (USDA) have been working in joint incident command to eradicate VND in Southern California. The highly contagious virus has resulted, or will soon result, in the euthanasia of more than one million birds in Los Angeles, Riverside, San Bernardino, and Ventura counties. Birds from four poultry industry producers in Riverside County and two poultry industry producer in San Bernardino County have also been infected with VND and all birds in those facilities have been or will be euthanized. For more information about movement restrictions, biosecurity, and testing requirements, please call the Sick Bird Hotline (866) 922-2473 or email SFSPermits@cdfa.ca.gov.